urban stress and their ornamental qualities in the landscape. Visitors can find nearly 600 willows from the United Kingdom, Russia, Poland, and North America which shows the adaptability of the Salix species to our urban environment. During the construction of the 4-H building, many of our willows were moved or removed. We are in the process of restoring the collection to its original glory. and agriculture. The Latin genus name of willow is Salix, It is the main ingredient in Aspirin (salicylic acid) one of the earliest and broadly available medicines use for pain relief. It has also been a creative influence in art and literature. Having influences on folklore and mythology, the willow species appears prevalent in many cultures. This species is truly one for all seasons. There are 150 willow taxa with 60 species and cultivars. Throughout the year the Salix species provides structural interest with their varying forms from twisted and curled to straight and sturdy. 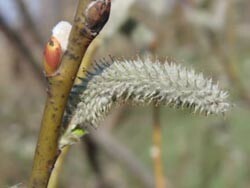 In the springtime, the trademark catkins are dominantly displayed on the branches. Summer leaves present a multitude of green shades, ranging from yellowish to bluish. 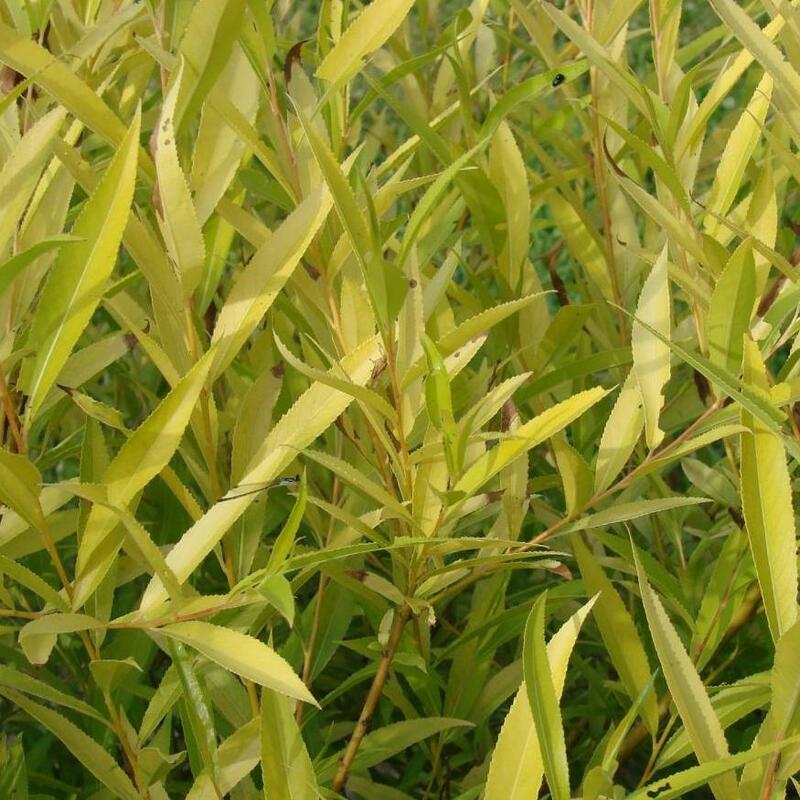 During the fall months, the willow leaves are a variety of yellow hues. Through the winter, stems exhibit a colorful variety of reds, oranges, purples, and golds. With a superb view of the south end of the research pond, the willow collection is an enjoyable place to visit. The following is an abstract from PhD student Yulia A. Kuzovkina-Eischen's 2003 dissertation on Stress Tolerance and Horticultural Evaluation of the Genus Salix. Her advisor was Dr. Martin Quigley and committee members included Dr. Michael Knee, Dr. Stephen Still, and Dr. Davis Sydnor. Click Stress Tolerance and Horticultural Evaluation of the Genus Salix to view her entire dissertation. 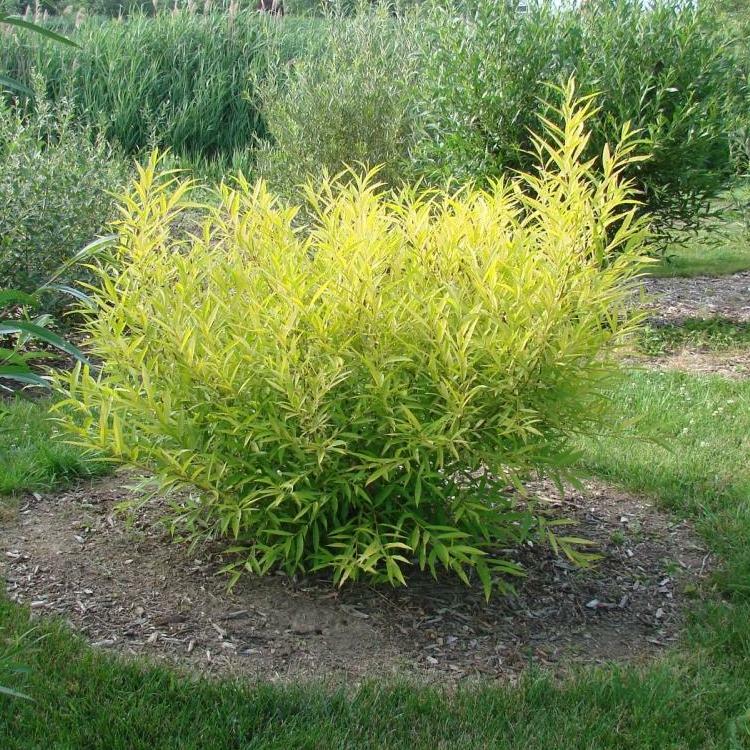 The objectives of this study were to investigate the adaptability of the genus Salix to stressful conditions and to promulgate its ornamental potential. This research has focused on Salix’s tolerance of natural and anthropogenic stresses, including flooded soils, soil compaction, heavy metals, and ozone pollution; all are common conditions in urban environments. I found that neither soil compaction nor flooding caused a significant reduction in the growth of willows, but that anaerobic conditions rapidly triggered a wide range of morphological adaptations. The copper and cadmium uptake study, conducted in a greenhouse hydroponic system, revealed a general tolerance of willows of increased metal in the solution and the translocation of metal into plant aerial organs; copper appears to be more toxic to plants and less mobile than cadmium. The response of Salix species to acute ozone exposure was studied in a fumigation chamber and it revealed marked interspecific differences; both ozone-sensitive and ozone-tolerant species were documented. The ornamental qualities of cut branches from twenty species and cultivars of shrubby willows were evaluated and described in detail, focusing on those attributes, and phenological sequence, important for the floral industry. More than fifty promising willow species for alpine and small urban gardens were selected based on multi-year observations. Their names were taxonomically verified, and they are presented with detailed descriptions, horticultural uses and requirements, and details of provenance. Many sculptors and fiber artists, including Dorothy Gill Barnes and Patrick Dougherty have worked with Chadwick Arboretum & Learning Gardens horticulturists to gather materials for their internationally known artistic works and to get inspiration from nature in our gardens. This is especially true of our vast, diverse willow collection. Dorothy Barnes is primarily interested in woody plants that are ready for the mulch pile or pruning. We have often alerted her when a particular tree needs pruning or needs to be removed due to storm damage. She has worked with our willows when they are ready to be coppiced for rejuvenation in the spring. At pruning time, we have provided Patrick Dougherty with willows for some of his major works, especially the installation he did for the Franklin Park Conservatory in 2006. In addition to the many artistic endeavors that our willows support, cuttings from our willows are donated to the Columbus Zoo for moose, elk, and porcupine to browse. Note that these cuttings are provided by Chadwick Arboretum students and staff only. 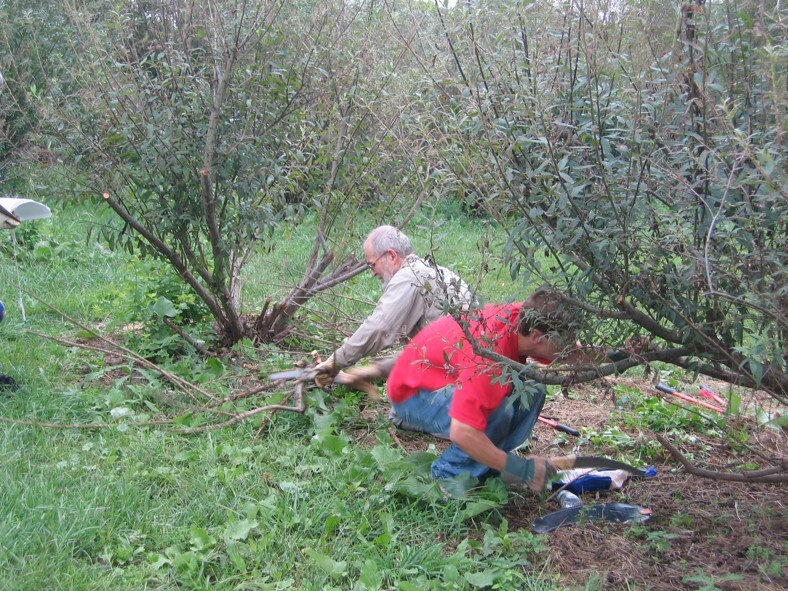 Cutting willows by individuals is not permitted. Click on the willow name below to view a photograph and one or more links to information about these trees from The Ohio State University Plant Facts, Wikipedia, and/or USDA Plants Database. Or, click Plant Search Database and simply enter the botanical name (genus only will work) of any tree on The Ohio State University Columbus campus. If you do not know a tree's botanical name, you can find it by searching the web using the tree's common name. We are in the process of adding QR codes to our plant labels throughout the arboretum. If you are walking in the gardens and see a plant label with a QR code, use your smart phone or tablet QR reader app to access a photograph and description or link to additional information about the tree. If you don't have a QR reader app, you can download one for free from your app store.